Since 5 years I practise ‚Linux on the desktop‘ and during that time, Ubuntu was my main OS. Before, I just tried different distributions (Slackware, Debian, …) on dedicated hardware, just to learn about Linux, for fun, but not for production and in my daily life. 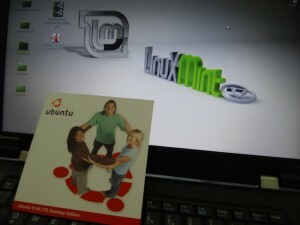 So I became a Ubuntu follower with 6.04 and it was great fun, as it united a lot of positive aspects, esp. it was very easy to configure and had a great multimedia support. So all in all, it introduced more and more commerce by Collonical, but from my perspective it didn’t introduce any new features that increased my productivity nor solved issues in my workflow. While there is a growing number of distros out there, I just wanted what I had for long time with Ubuntu: a easy to use and open Desktop Linux. I guess, thats what I found with Linux Mint. But all in all, it feels like home. Cinamon is a clean but also modern desktop GUI, that also convinced me as a Gnome2/GTK/… fan 🙂 You have nice extensions and a lot of useful options if you like to customize the look&feel. But hey, the defaults are pretty ok and without any ads everything is straight forward again and all tools just work without any tweaks. I absolutely understand the way you’re feeling. I’m finding myself again and again in a constant dilemma because on the one hand Ubuntu is not only super easy to use, but also gives you very convenient possibilities to navigate to and control just everything with the keyboard. I literally didn’t find a single menu where using the mouse was mandatory, which I really enjoyed. The downsides are the little cooperation with other open source projects. Unity is nice for sure, but why not make it in a way that it works together with other distros (I know there are packages for Arch and there is also an overlay in gentoo, but it’s still not the easy way to install it as other DEs)? Also, Unity is really bloated. My computer isn’t old and yet has its problems with Unity’s hunger for resources. I hope you’ll be happy with Mint and post some articles about that in the future, too.